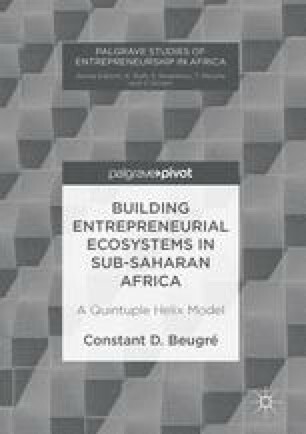 This chapter explores the role of international organizations in supporting the creation of entrepreneurial ecosystems in sub-Saharan Africa. The term “international organizations” is broadly used and includes foreign government development agencies, such as USAID, international nongovernmental organizations, and development agencies, such as the World Bank, the international private sector, and international universities. Such organizations can provide support in form of financial resources, expertise, training, and benchmarking opportunities. Examples of international programs that could support the development of entrepreneurial ecosystems in sub-Saharan Africa include the GET (Global Entrepreneurship Training) program funded by the government of South Korea and sponsored by UNESCO (United Nations Educational, Scientific and Cultural Organization) and the YALI (Young African Leadership Initiative) program supported by the White House.